By this time of year, I’m ready for spring to come. However there’s one thing that I look forward to…the arrival of all kinds of delicious and exotic citrus in the stores. Things like meyer lemons, sweet Cara Caras, plump Tangelos, and of course blood oranges. With their mottled color orange and red skin, along with the deep red colored flesh…they make for such a special treat that I can never pass up when I come across them in the store. My favorite thing to do with them is usually make margaritas, but since that’s out for me this season I’ve had to turn to other things. I’m freezing some juice, by the way, so that I can enjoy some of those delicious cocktails come summertime! I’ll probably need a margarita or two with 3 little boys to to look after…Ahhh, fun times ahead. Anyways, this cake. Yogurt cakes are one of my favorite baked goods on the planet. So much moisture and they love to take on the flavor of whatever fruit you want to throw into them. Case in point – blood oranges. The cake itself is studded with plenty of fresh zest and juice, and then topped with a gorgeous glaze simply made from some confectioner’s sugar and a bit of additional juice from the orange. Can you believe that color? So gorgeous. I topped with candied orange slices for a garnish that is almost too pretty to eat. Almost. 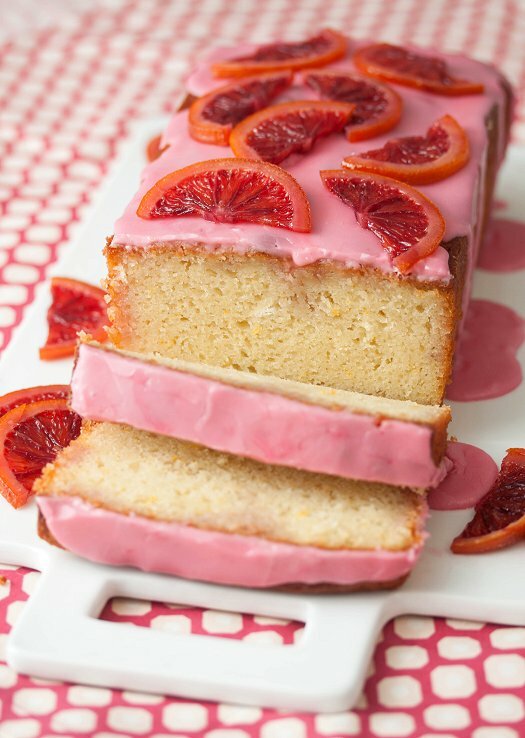 So, if you’ve seen these funny looking oranges in the store, but weren’t quite sure what to do with them – this easy cake is a great place to start. It’s wonderful for dessert, or a slice with your tea or coffee in the morning, or even for a fancy brunch…t’s sure to please everyone. Preheat oven to 350. Grease and flour a 8.5 inch x 4 inch loaf pan and set aside. In a small bowl combine the flour, baking powder, and salt. Whisk to combine. In the bowl of a standing mixer fitted with the whisk attachment combine the yogurt, sugar, eggs, orange zest, orange juice, and vanilla. Whisk to combine. With the mixer on running on low, add in the dry ingredients into just combined. Then pour the vegetable oil into the batter and mix until it’s combined well. Pour batter into loaf pan and bake in preheated oven for about 50 minutes, or until a toothpick inserted into the center comes out clean. To make the candied orange slices, wash and dry the orange thoroughly. Cut the orange in half lengthwise, then use a sharp knife to make very thin slices of orange. Poke out any seeds using a toothpick. Combine the sugar and water in a medium saucepan over medium-high heat. Heat the mixture until the sugar dissolves. Add the orange slices to the mixture so that they are in a single layer, reduce the heat to medium-low and let simmer about 20 minutes, turning the slices at least once so both sides are candied. Remove from the heat. Let air-dry on a cooling rack (place some paper towels underneath the rack to catch the syrup drips) until ready to garnish. When the cake is completely cool, combine the confectioners’ sugar and orange juice in a small bowl and whisk to blend until smooth. Adjust the consistency as needed with additional juice or confectioners’ sugar. 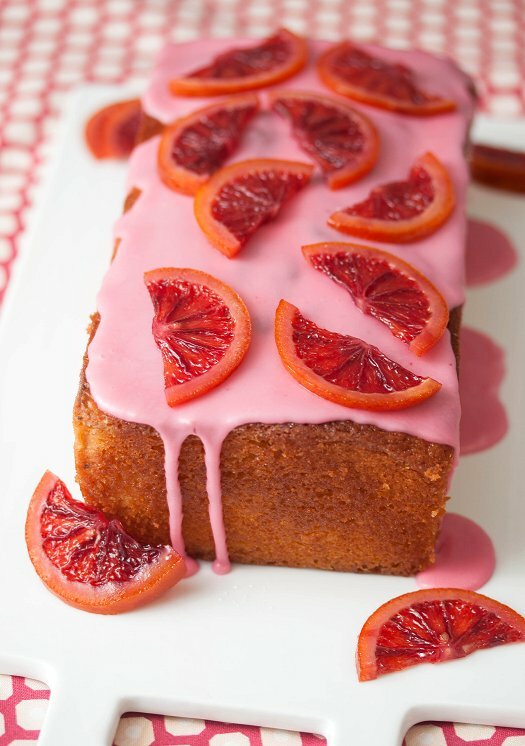 Drizzle the glaze over the top of the cake and garnish with the candied orange slices. Let stand briefly until the glaze sets. Slice and serve. Cake can be stored in an airtight container for up to 3 days. This picture is gorgeous. I need to stop slacking and make this cake! !